Do you want a checklist you can use to evaluate your learning design? Here’s my contribution (PDF). There are 14 items to evaluate. Once you’ve rated them all, you can glance down the “spectrum” column to see which items are closest to the dreaded “information dump” and therefore need the most work. This range-finding approach acknowledges that we’re all facing forces that push us toward information dumps. My goal is to suggest specific items to assess and discuss as we move stakeholders closer to the “action-oriented” side of the chart. 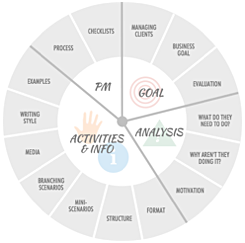 The tool can also be used to clarify what I intend to be the end result of action mapping. 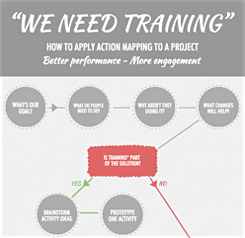 For example, if a client asks for an “action mapped” course, show them the chart. 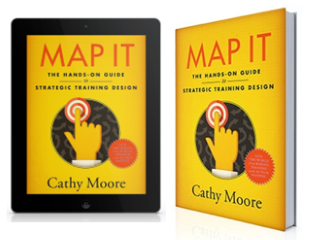 If they say, “Yes, I want everything on the left side of the chart,” then they understand the goal of action mapping and will probably buy in to the design process. This is great Cathy! Thanks so much for your quick guidance! As always I like your ideas and do what I can to use them. Meanwhile, I am still wondering how to work this way with an introduction course. A sales course, yes! An introduction course, hmm. Well, hmm… Isn’t this a little bit too obvious? The questions themselves are a bit leading and when stated like this I don’t think any sound person whould aim for the ones to the right. It would be more useful if the tone and wordings were more “forgiving” of what we know to be wrong. Now it’s a little bit like “Where on the scale from Good to Dumb do you want your course to be?” and that’s not that relevant, is it? Anyone getting what I’m saying here? I guess you could make the course about how and where to find resources on the intranet etc. If the object is just “to make the participants feel good about the company” you’d probably be better of producing a 2 min inspirational movie instead. @Henke yes, this is what I am aiming at now – guiding people to the practical tools and processes we use to get things done. Some things cannot be built as a five-star action-oriented thingy. Some things only says “go to x to accomplish y”. If a person needs the dry information to succeed they will enjoy it. Cathy – this is thought-provoking and helpful. A little overwhelming to think about shifting my paradigm yet again, but much needed help. Thanks. Patrick, I’d suggest that if you just need to provide simple information like “go to X to accomplish Y” then you might not actually need a course. You might just need a job aid or similar reference. Sometimes the obvious must be explicitly stated so people perceive its flawness. Cathy: Yes, indeed. Some parts I discover in my work of oboarding people refer a lot to an improved intranet, improved documents, improved handbooks, etc. So all I can do in my course is to point to these resources. The rest I will try to make as interesting as possible. This is an asset – I like the format and the evaluation process it provides – I agree a little with Henke’s comments about the terminology and will think through this carefully when I design version. I need a way of evaluating some off-the-shelf courses and I think this will work very well. 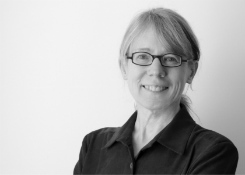 Thanks again Cathy – you have a knack for providing guidance just when I need it. @ Henke & Patrik: to me the objectives on the right indicate ‘on time learning’ rather than an interactive eLearning course. Often users don’t need to ‘know’ this stuff – they just need to know how to find the information if required. I think it should also be remembered that this is just an example and the wording your choose is it entirely your own. Great article and great comments by others. 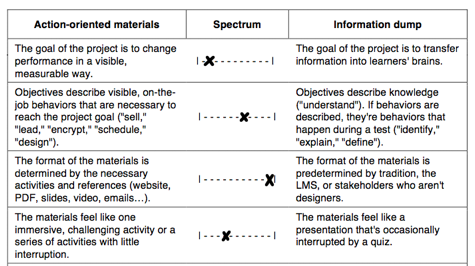 But the spectrum varies based on the content you want the learners to absorb. Some of the management courses can be action mapped, but I believe the science courses (to know about a product or process) need to be on the information rich ( I don’t want to call it “information dump”). Like Jennifer pointed out – it is absolutely necessary to have the information right when you need it. So if the goals are set right, you can design a platform or use an existing LMS to suit both action mapped of knowledge courses. Action mapped – suits well for a technician. Knowledge based – suits well for an engineer. We are a startup focused on collaborative e-learning targeting higher education. Thanks Cathy! I like how you delimit the population for which to use this tool. Natraj, thanks for your comment. I’d like to clarify that I’m not saying “remove all information from courses.” As the checklist points out, I’m suggesting that it’s best to use elearning for its interactive component — to help people practice applying information. We can put the information itself in a format that’s easy to refer to on the job, outside of the course but accessible to everyone taking the course. So I’d still suggest that training about products or processes can be designed as a series of activities in which learners practice selling/using the product or following the process. To complete the activities, learners would access detailed information in real-world references or job aids. So I agree that “it is absolutely necessary to have the information right when you need it.” I just don’t think that the best place is always in the course. Instead, it can be in real-world job aids and references that are available to people taking the course — and available on the job long after the learner completes the course. The checklist is intended for people in the corporate world who design training and support for people who need to immediately apply new information on the job. Of course, goals in higher education may be different. I do agree with you on the core concept of the activity driven training process, it would be up-to the designer to choose the threshold of were they want to positon their training module. Very insightful comment and does actually agree upon what I said about the wordings being a little bit too obvious. It might be better to change it from “Information dump” to your “On-time learning” or “Information-finding course”. Yes “Information dump” is a clearly stated set of words which shows you the flaws, and that’s great when evaluating off-the-shelves courses, but it might be to subjective when the evaluation itself is going on. But, on the other hand. If you can be self-critical enough it might be good to use it the way Jennifer says here in the training need analysis phase. One last thing, you guys are fantastic! These comments are actually as informing as Cathy’s great posts! Hey Cathy Moore i like to read this article its great information. Cathy, just wanted to say a big thank you for sharing this information. It’s makes so much sense and has direct relevance while creating learning. It was very helpful to me. Also, I have include your post as a reference! Christopher – that website was a treasure trove! Thanks for sharing. Thank you very much Shanti! If I can be valuable do not hesitate to contact me! Fantastic visual reminder to cross swords with our bias to the easy information dump approach. I would hang this on my wall office wall in a golden frame.